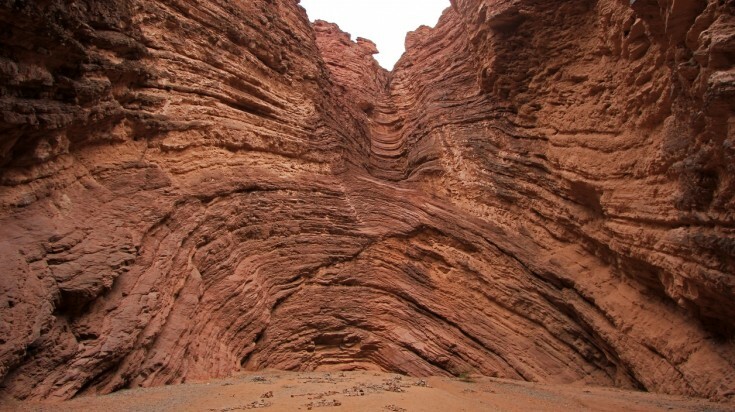 Located in the northern Argentine province of Salta, the Quebrada de las Conchas is home to some of the country's most impressive rock formations. Also known as the Quebrada de Cafayate, this deep canyon is framed by extraordinary rock walls showcasing layers of stunning colors, from deep red to vivid green to cobalt blue. Millennia of wind, rain, cold and harsh weather conditions have carved and eroded the rocks into unusual shapes, creating a visual feast for all who travel along this winding route. For more than 60 kilometers follow the famous Route 68 as you travel through the depths of the Quebrada de las Conchas. 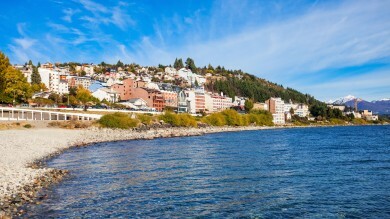 Drive along the shores of the Rio de las Conchas, across a wild landscape of colorful sandstone and past curious rock formations, exploring this remarkable and breathtaking region of Argentina. 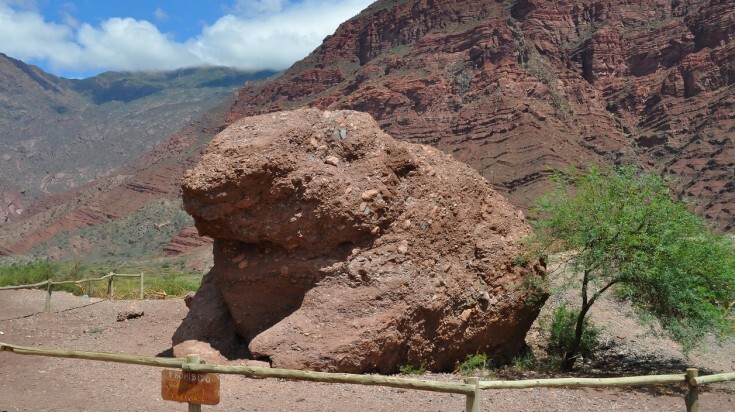 The Devil's Throat or Garganta del Diablo is one of Quebrada de las Conchas main attractions, and the first you'll see if arriving from Salta. A narrow canyon of rock, the layers are split in two given visitors the impression they are standing at the back of a throat. Walk to the middle of the canyon and feel very small as you look up at the blue sky through the rocks' narrow opening. Visitor can also take in the Garganta del Diablo from another angle by trekking to the top. The climb will be steep - it's easier going up than it is coming down - but the views of the scenery are spectacular. El Anfiteatro in a natural amphitheatre carved from red stone. Surrounded by 20-meter tall walls, El Anfiteatro is a flat surface that is fully accessible on foot. Stand in the centre, look straight up at the clear blue sky and take in the near-perfect acoustics in this natural wonder. With an acoustic quality almost rivaling the Teatre Colon in Buenos Aires, El Anfiteatre is the perfect place to take in a concert, or even sing a few notes of your own. El Sapo is a set of clustered rocks located on the side of Route 68. Brown and round, the way that these rocks formed give the impression that a gigantic frog or toad is sitting on the side of the road. Make a quick stop at El Sapo for a quick photo of this quirky formation. Deep inside a valley of multicolored mountains and hills you'll find La Yesera, one of the regions most important archaeological sites. Millions of years ago, the Quebrada de las Conchas was covered by an enormous inland sea. Most remains of the sea have disappeared, save for a few fossils and seashells that dot the land. Walk around La Yesera and see deposits of fossilized fish, seashells, and salt that are found throughout the valley. Standing tall and proud, El Obelisco is a tower of sandstone and clay. Measuring more than 26 meters, El Obelisco is so smooth and straight you'll have a hard time believing it was made by nature. Years of erosion have carved away at the red rock face creating impressive columns and towers that help give The Castle its majestic appearance. Standing tall above the green valley floor, Los Castillos are easily visible from Route 68. Navigating the Quebrada de la Conchas independently is both easy and enjoyable, as long as you have your own vehicle. 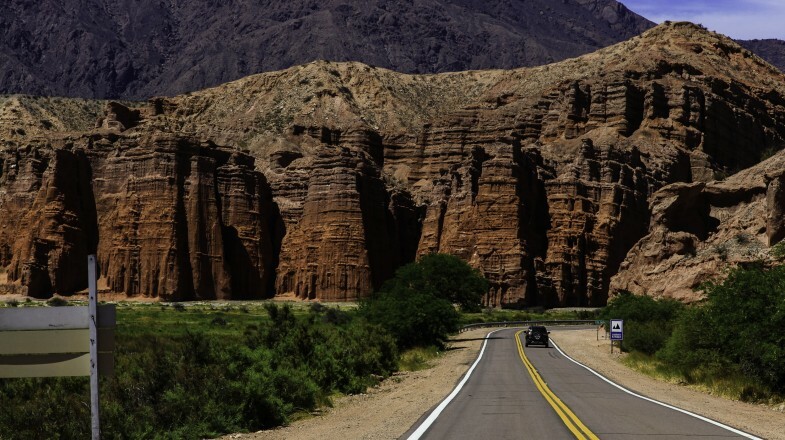 From Salta, drive south along famous Route 68 to Alemania. This first leg of the journey will take nearly two hours, but the natural scenery is exquisite. From Alemania, continue along Route 68 as you weave and wind your way through the valley, passing noteworthy sights and historic landscapes, making your way to Cafayate. 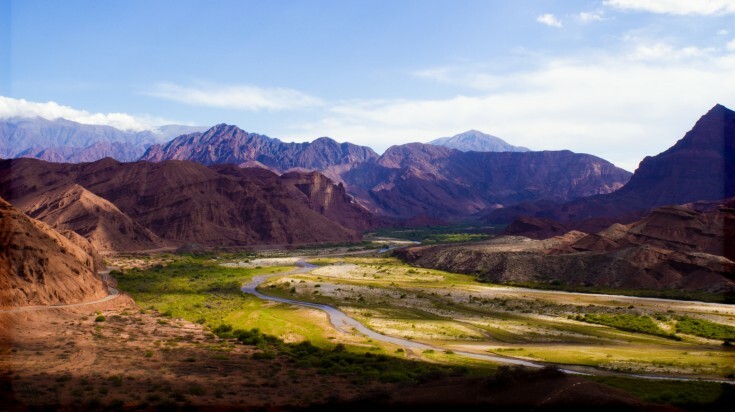 From Cafayate, drive north on Route 68 in the direction of Salta. After a short 12-minute drive, you'll encounter the first of many attractions, Los Medanos (the Sand Dunes). Continue driving north along Route 68 through the Quebrada de las Conchas, passing by the areas most interesting and awe-inspiring sites. If you don't have access to a car, the most convenient and relaxing way to see the Quebrada de las Conchas is by joining an organized tour. Tours can be arranged in either Salta or Cafayate and are a great way to see the sites without the hassle of navigating and reading a map. It is also possible to walk or bike the route; however, this is not for the faint of heart as the route leaves travelers exposed to the hot sun, high winds, and harsh elements. If you choose to explore the route on foot or via bike, ensure you've packed enough water and food, and the appropriate gear to get you from one end to the other. The best time to visit is late in the afternoon when the low sun brings out the vivid colours of the rock layers. Good to visit in August, September, October or November to avoid very high and low temperatures; however, be prepared for strong winds in August. Famous for having one of the best climates in the region, temperatures in the summer can reach up to 37°C with rain showers in the afternoon. There are very few rest stops along the route, so pack a snack or lunch and water to ensure you have a most pleasant day. Most of the attractions are visible from the road; however, they are not well marked. To avoid missing any of these magnificent geographic sites, take a good map or guidebook with you and keep your eyes peeled. Keep an eye out for wild burros, which call the shores of the river home, and birds of prey flying above the route. The rock erodes very easily. Try to avoid touching it as much as you can to preserve this natural wonder. The Quebrada de las Conchas is a wild and breathtaking region of Argentina. 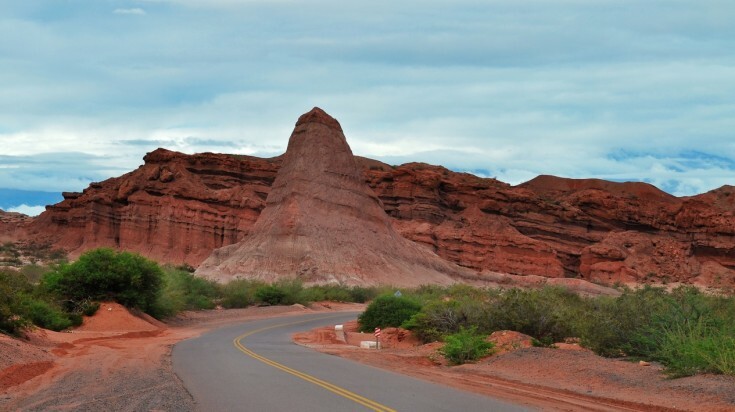 Home to more than 60 kilometers of colorful and unusual rock formation, the Quebrada de las Conchas is not only a feast for the eyes, but a must-see for anyone traveling throughout Salta. Pack some snacks and have your camera ready, because these geographic wonders are not to be missed.